There are 3 major caller ID specifications in the world: DTMF, ETSI FSK and Bellcore FSK. When users buy a foreign telephone devices(such as cordless phone, fax machine or computer telephony interface), may encounter the problems of non-match for caller ID standard. This will cause the device unable to display the caller ID. EX220 can solve this problem easily. 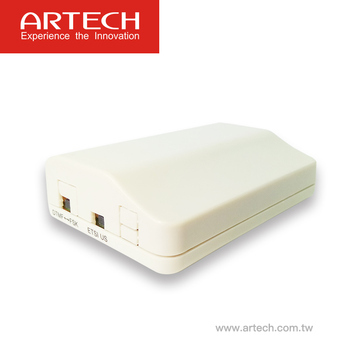 This product can receive all 3 kinds of caller ID format, and convert to FSK(Bellcore or ETSI selectable) to match foreign telephone's standard. EX220 has a rechargeable battery inside the device, during idle status, it gets power from the telephone line and recharge the battery, so no need to use or replace battery. Just plug one end to telephone line, and the other to the telephone device. For example, if you live in Netherlands, Saudi or India, the caller ID standard is DTMF. You purchased a cordless caller ID phone from US(which uses Bellcore FSK standard), or from Germany(which uses ETSI FSK standard). You won't be able to use the caller ID feature. In this case, just get one EX220 and connect it between the telephone line and the cordless phone, your cordless caller ID phone will display the caller's number immediately. 1. 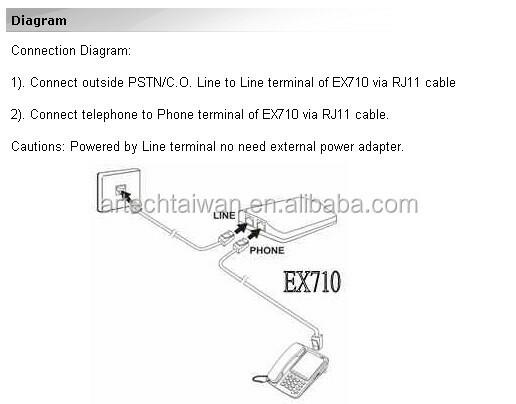 Telephone sets for UK and Japan standard are not applicable.